Model recreation of missing link animal. Source of image: Online version of NYT article cited below. Scientists have discovered fossils of a 375-million-year-old fish, a large scaly creature not seen before, that they say is a long-sought missing link in the evolution of some fishes from water to a life walking on four limbs on land. In two reports today in the journal Nature, a team of scientists led by Neil H. Shubin of the University of Chicago say they have uncovered several well-preserved skeletons of the fossil fish in sediments of former streambeds in the Canadian Arctic, 600 miles from the North Pole. The skeletons have the fins, scales and other attributes of a giant fish, four to nine feet long. But on closer examination, the scientists found telling anatomical traits of a transitional creature, a fish that is still a fish but has changes that anticipate the emergence of land animals — and is thus a predecessor of amphibians, reptiles and dinosaurs, mammals and eventually humans. In the fishes’ forward fins, the scientists found evidence of limbs in the making. There are the beginnings of digits, proto-wrists, elbows and shoulders. 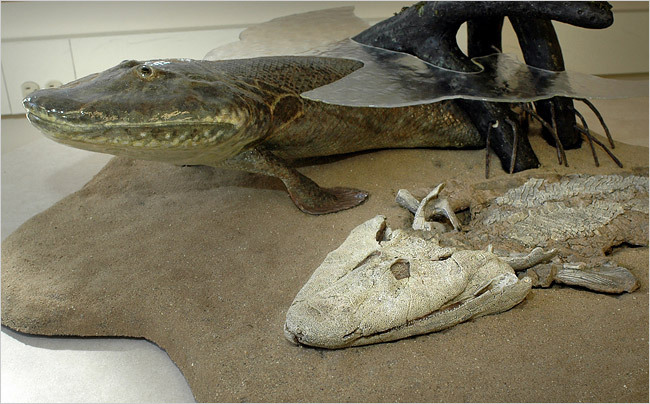 The fish also had a flat skull resembling a crocodile’s, a neck, ribs and other parts that were similar to four-legged land animals known as tetrapods. Other scientists said that in addition to confirming elements of a major transition in evolution, the fossils were a powerful rebuttal to religious creationists, who have long argued that the absence of such transitional creatures are a serious weakness in Darwin’s theory. Two other paleontologists, commenting on the find in a separate article in the journal, said that a few other transitional fish had been previously discovered from approximately the same Late Devonian time period, 385 million to 359 million years ago. 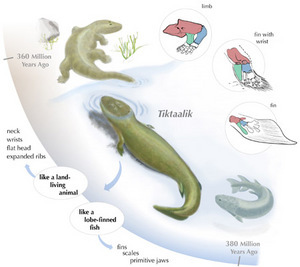 But Tiktaalik is so clearly an intermediate ”link between fishes and land vertebrates,” they said, that it ”might in time become as much an evolutionary icon as the proto-bird Archaeopteryx,” which bridged the gap between reptiles (probably dinosaurs) and today’s birds. The writers, Erik Ahlberg of Uppsala University in Sweden and Jennifer A. Clack of the University of Cambridge in England, are often viewed as rivals to Dr. Shubin’s team in the search for intermediate species in the evolution from fish to the first animals to colonize land. JOHN NOBLE WILFORD. "Fossil Called Missing Link From Sea to Land Animals." The New York Times (Thursday, April 6, 2006): A1. It is really great discovery. It is good to see some evident to link between sea and land animals. The StatCounter number above reports the number of "page loads" since the counter was installed late on 2/26/08. Page loads are defined on the site as "The number of times your page has been visited."